A great color-bright collection of prints from Nancy Halvorsen! These sunny prints are sure to make you smile. From the cool paisley, to colorful stripes, dots, circles, and swirls, Nancy has created a fabric group that has unlimited possibilities. This book features a block of the month with positive, inspirational words each month. Make the entire quilt or choose individual blocks for mini quilts, or pillows. This BOM starts in September and the cost is $12.99 per month. 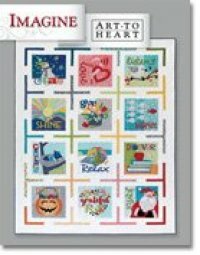 Bring in your finished block appliqued and receive 20% off your next block. We will have a sew day for those who need a little help on Applique on the 2nd Tues of each month from 11 - 4. The first sew day is Tuesday September 12th. If you missed the first month, no worries stop in get signed up and you can get caught up in no time. We have all 12 months complete for you to see!